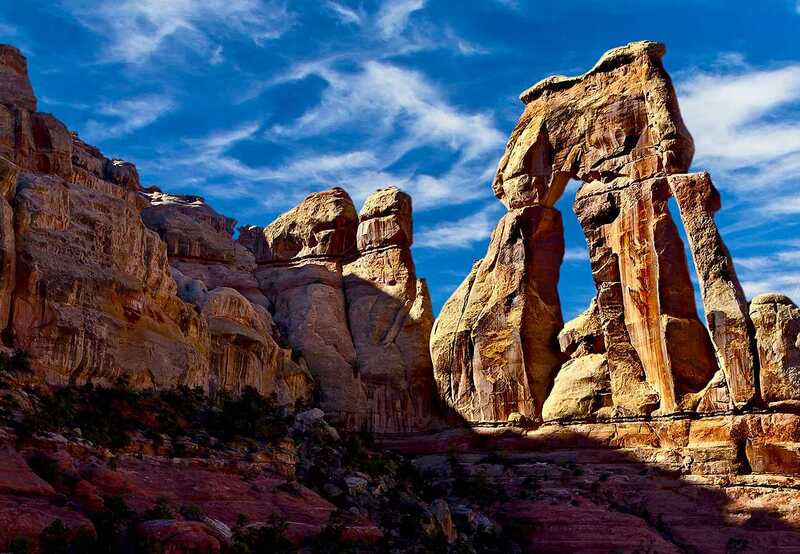 Druid Arch is one of the most popular destinations in the Needles District. 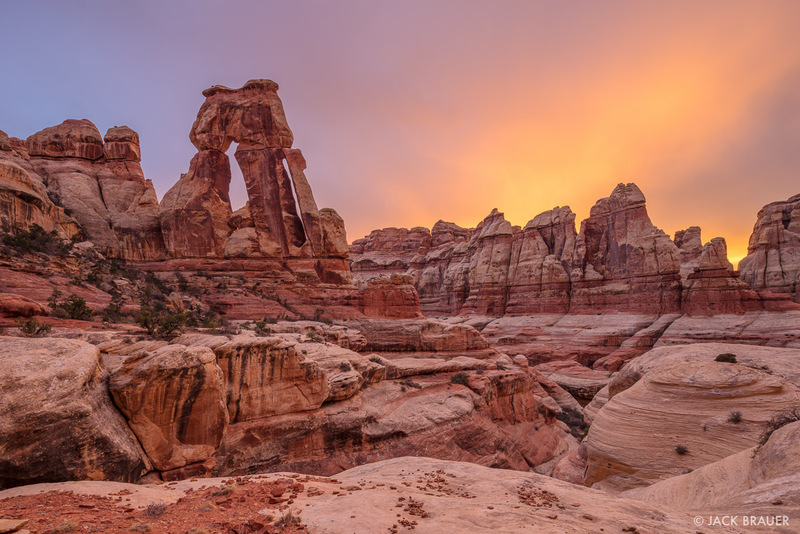 In addition to seeing a spectacular arch, however, hikers can experience much of the special environment of the Needles area on the trail to the arch. You can reach Druid Arch from several routes, but the most commonly used route is the out-and-back route from Elephant Hill Trailhead. Shortly after leaving the trailhead, you pass through a joint between two rock formations and then go over a stretch of slickrock before reaching the first junction at the 1.5-mile mark. The left fork goes to Squaw Flat Campground. You go right (west) on the trail to Chesler Park. In the next short stretch of trail, you pass over the small divide between Big Spring Canyon and Elephant Canyon. The trail goes through a gorgeous narrow where you get a good view both ways of these two canyons. Then the trail drops into the dry wash of Elephant Canyon, where you see the signs for backcountry campsites. From this junction the trail stays right in the Elephant Canyon dry wash. You’ll see the trail to Squaw Canyon going off to the left (east). Keep going straight (south) up the canyon wash. Most of the last 2 miles of the trail to Druid Arch stays right in the dry wash of Elephant Canyon, sometimes leaving the canyon briefly on the left flank before dropping back into the dry wash again. Then, about a half mile from Druid Arch, the trail starts climbing steeply up to a bench just below the well-named arch, a delightful place to spend an hour or two before retracing your steps to Elephant Hill Trailhead or your backcountry campsite. 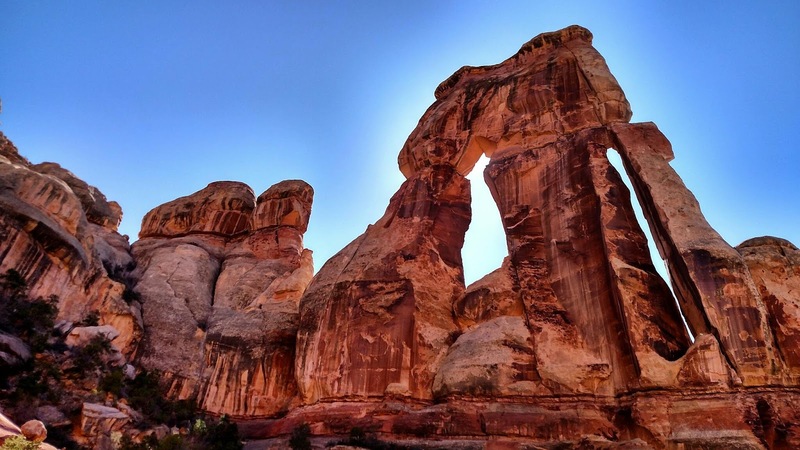 Overview: A scenic day hike or overnight backpack to a spectacular arch, one of the most popular destinations in the Needles District. Finding the trailhead: To find the Elephant Hill Trailhead, drive 3.1 miles from the entrance station on the main park road until you see a paved road going off to the left to Squaw Flat Campground and Elephant Hill. Take this left and 0.3 mile later take a right onto another paved road. Then take another right 0.5 mile later onto the unpaved, two-wheel-drive Elephant Hill Access Road. Once on the unpaved road, it’s 3 miles to the trailhead. Drive slowly on this road, especially around several blind corners.